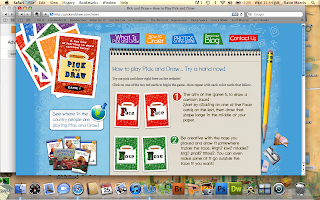 Have you heard of Pick and Draw? 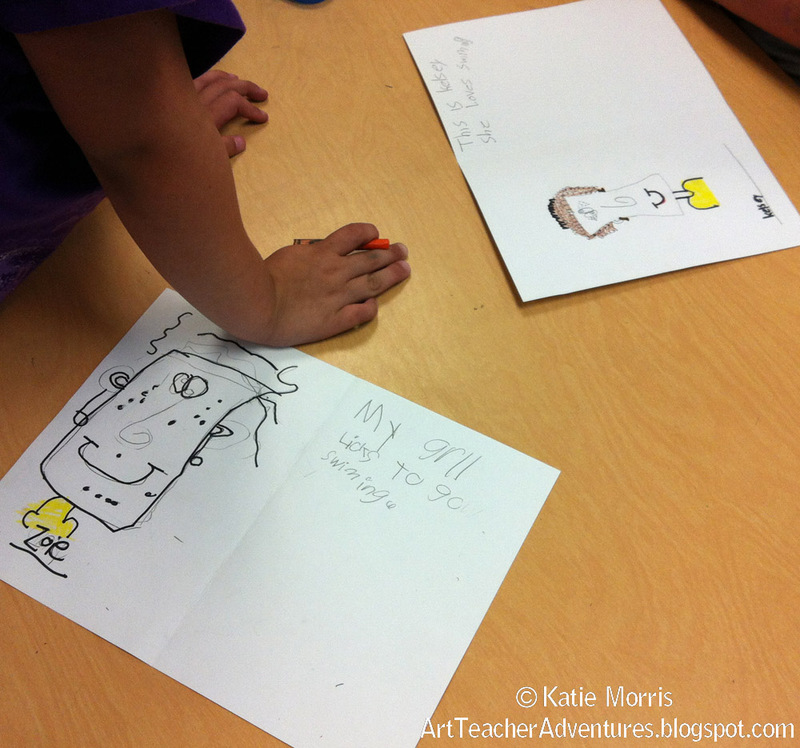 Pick and Draw is a cartoon drawing card game that was a big hit with my students. I won a copy of the game in a blog give away this spring and was excited to try it out. Here's a brief explanation of how the game works: the cards are sorted into the categories of Face, Nose, Eyes, Mouth, and Hair. You pick a card for one category at a time and everyone playing draws what's on the card. It may sound like everyone is drawing the same thing, but that's not the case! Well, you might be drawing the same lines and shapes, but the size, orientation, placement, etc. provide a lot of possibilities for creativity within the constraints of the game. There is even a card in the set that shows two different-looking faces that were drawn using the same lines to explain the concept. After the basics are drawn, you go back and add more details to develop the character. If you visit the website, www.PickandDraw.com, you can spend a few minutes exploring, watch a video of the creator, Rich Davis teaching the game to students, and even try it out for yourself with some sample cards online. I've only played this game with students once so far, a class of 1st graders on an "extra" class when the schedule was kind of weird. I'm excited to try it out with some older students this year. I used the website to introduce the game and used the paint program on my school laptop to demonstrate with the sample cards online. I think with older students, you could probably have each table draw a card for each category, but since I was working with 1st graders, the whole class used the same card. 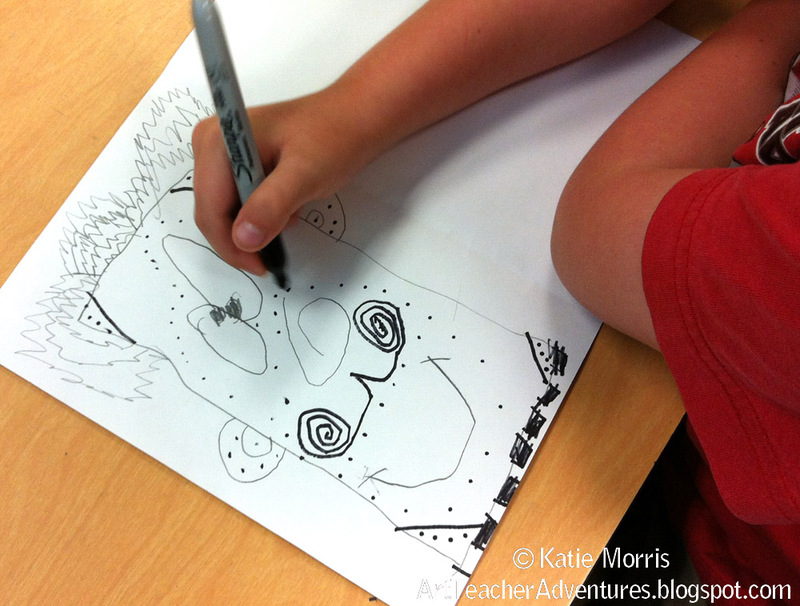 After the drawing was finished, I let the students vote on making another cartoon, or spending more time on their first cartoon. Almost all of them wanted to keep working on the first cartoon. 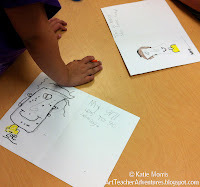 They added more details and even wrote information about the character. 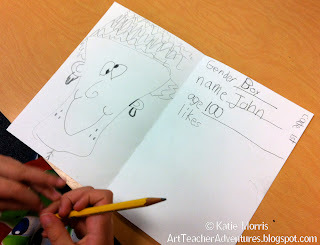 You can see in the photo below, the students started making a list of gender, name, age, and likes. I think he ended up filling the rest of his page writing about the character. This game could be used even in the general ed classroom as a writing prompt. My game showed up in the mail on a Friday and I was too anxious to wait for a chance to try it out at school. My 6 year old niece was in town so we tried it and she LOVED the game. The next couple times she saw me she asked to play it again. I'm going to order a copy for her birthday- they are only $10 on the Pick and Draw website!